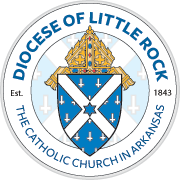 "Of You My Heart Has Spoken"
Archbishop J. Peter Sartain’s six years as bishop of Little Rock marked by far the shortest length of service in diocesan history, but it was time well spent. The youthful prelate’s intellect, piety and charm inspired thousands, many on a deeply personal level. Archbishop Sartain (then Bishop Sartain) had an uncanny knack for remembering names and devoted his full attention to every conversation. James Peter Sartain was born in Memphis, Tenn. and was ordained on July 15, 1978 at the Cathedral of the Immaculate Conception after studying for the priesthood in Indiana and Rome. At the time of his episcopal appointment, Father Sartain was vicar general of the Diocese of Memphis and pastor of St. Louis Church. He had vacationed in neighboring Arkansas and made retreats at Subiaco Abbey. His installation as the sixth bishop of Little Rock on March 6, 2000, drew 2,600 Catholics to Robinson Auditorium. The new shepherd’s shared focus became fostering religious vocations among the youth — he visited often with seminarians and their families — while ministering to the state’s burgeoning Hispanic population, notably in northwest Arkansas. He took a crash course in Spanish at the Mexican American Cultural Center in San Antonio in 2001. Bishop Sartain built on a foundation laid by his predecessor, Bishop McDonald, by continuing to celebrate Masses said on a statewide scale in both English and Spanish and by re-emphasizing the need for priests and seminarians to learn the second language. He dedicated new parishes organized by Hispanic immigrants in Danville and Glenwood, led an eight-day diocesan pilgrimage to Mexico in 2004, ordained a Mexican-born priest and deacon, and joined the nation’s bishops in calling for immigration reform with an emphasis on human dignity. Many Mexican-born immigrants worked in poultry plants across Arkansas. An intensely prayerful man, Bishop Sartain challenged all priests and religious in the diocese to deepen their commitment by taking time daily to give themselves to God. A gifted communicator, Bishop Sartain spoke and wrote with passion and eloquence. His weekly columns in the Arkansas Catholic often reflected on his relationship with Jesus Christ and the challenges of living a Christian life. He published a 385-page collection of selected columns in 2005. The bishop held national offices within the U.S. Conference of Catholic Bishops, including a three-year term as chairman of the Committee on the Home Missions. The need for vocations remained a constant theme, especially given the aging group of diocesan priests who were struggling to serve a Catholic population that rose from 90,600 when Bishop Sartain came to Arkansas to more than 107,000 upon his departure. 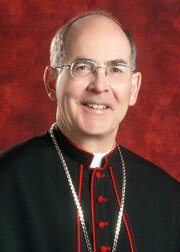 Pope Benedict XVI named Bishop Sartain, 53, the fourth bishop of Joliet, Ill. on May 16, 2006. Four years later, on Sept. 16, 2010, the Holy Father appointed the bishop to the Archdiocese of Seattle. On Dec. 1, Archbishop Sartain was installed as the fifth archbishop of western Washington's 579,000 registered Catholics.